On the same specimen there are two very rare species. 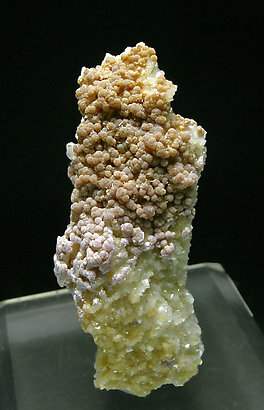 Beige crystals of Kosnarite with pinkish, radial aggregates of Zanazziite, on white Albite matrix. The Zanazziite has been carefully analyzed and the result is surprising: iron is nearly replaced by manganese (thus its pinkish shade), so we present it as manganoan Zanazziite. Matrix is Albite. We’ll send a copy of the analysis to the buyer. On the same specimen there are two very rare species. 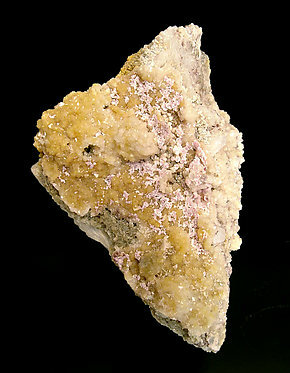 Kosnarite in pseudo-octahedral, creamy, crystals with very sharp and bright faces and edges. The Zanazziite has been carefully analyzed and the result is surprising: iron is nearly replaced by manganese (thus its pinkish shade), so we present it as manganoan Zanazziite. Matrix is Albite. We’ll send a copy of the analysis to the buyer.